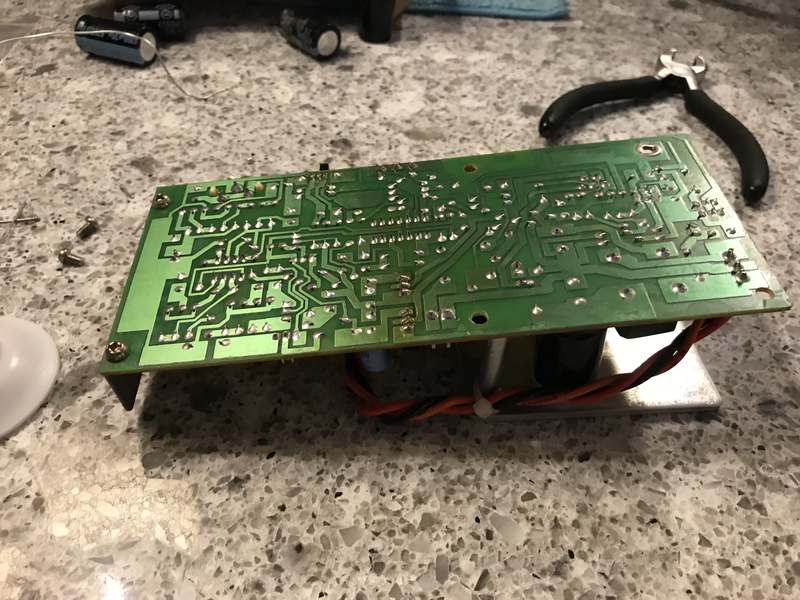 Thought I would share some valuable information with you, if you are stuck with a faulty plate amp (for sub drivers) on one of your vintage speakers. In my case, I had a plate amp go on me on my RT3000p. My heart sank cause I knew I would not be able to find another replacement plate amp (I was wrong). Being in Canada, my options were limited, call the Polk rep, who then referred me to an electronics repair company in Ontario. 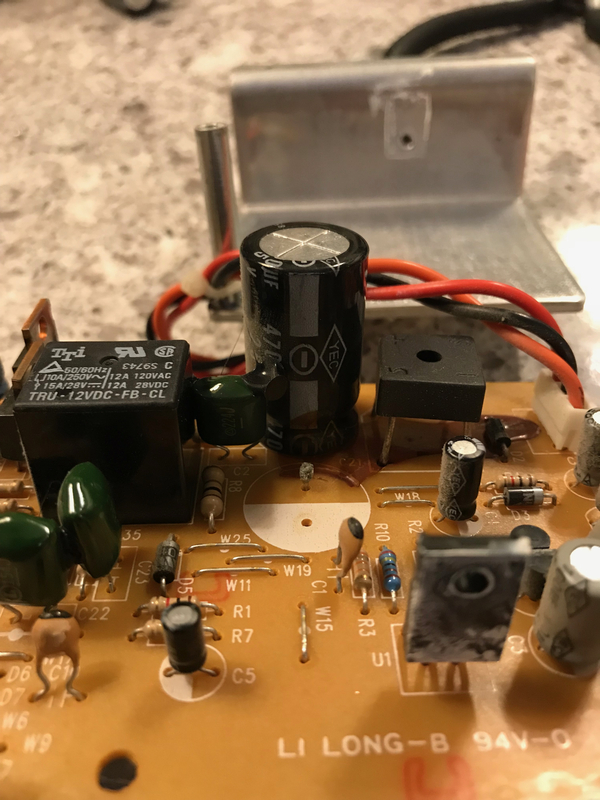 After looking over my plate amp (was making a loud buzzing sound), they concluded that the amp was not repairable (it is see below), but surprisingly, they had rebuilt plate amps lying in inventory, and cheap too. So a day later, I had a rebuilt unit sitting at my house, working perfectly. If you are in Canada, you can contact Walter Moser, or contact me as well, to put you in touch with that repair company. As for the rest, after looking around on the net, I found the Holy Grail of repair companies, who bring vintage plate amps back to life. Their eBay handle is "electronetix", and they currently have a few auctions up for plate amp repairs. The way it works, you buy the auction on eBay, which covers parts and man-hours to repair your plate amp. Their prices are extremely reasonable. They ensured me that, minus the power supply, all other parts are repairable with over-the-shelf parts, which I believe. Looking for RT2000i's or RT3000p's...PM me...or click on profile and respond to my WTB ads...thanks!!! Hi, I have a pair of RTi 100 tower speakers in great shape, both have built-in subwoofer amplifier system. One of the tower speaker is generating humming noise when it is switched to "Auto" that kicks in the subwoofer function. (Both the towers are hooked up to the AC outlet). Also, when I move the volume knob for increasing the sound, the humming noise also increases. I called Polk Audio and they provided me with Canadian Ontario Technician's contact but most of the times it is difficult to communicate him and get info from him as he is travelling most of the times, plus I do not know if he provides with a warranty after repair of the amplifier circuit plate and do they replace the plate or repair it. The postal charge is about $21for sending this plate to Ontario from Newfoundland and one of the local technicians told me its all digital switching plate so has to be replaced as they are difficult to repair. Now any one of you knows about this or have any experience, I do not want to junk them as they are absolutely wonderful speaker set. Buzzing from an RT series plate amp is almost always the power caps going bad. You can either order the replacement parts from Polk Customer Service and do the repair yourself or take it to a repair shop to have done. Unless the amp has been severely damaged by a power spike, it is likely not beyond repair. Here's the thread with all the vintage schematics and wire diagrams. Not sure of the differences between the RT1000P & the RT1000i in terms of the amps. Thanks "dpowell"... You gave me the key to the problem and confidence to tackle the problem. I took apart my RT1000P amp and noticed the Paper caps leaking and loose. The amp has 4700uF 25V capacitors. I was not able to find that same one locally, but I was able to find 4700uF 35V and installed them. 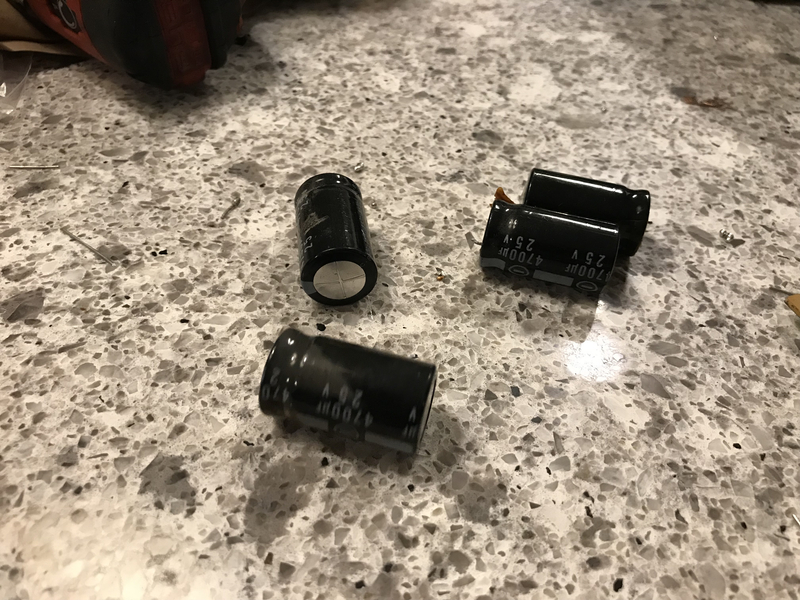 From both speakers I found 3 out of the 4 capacitors (4700uF 25V) leaking and loose. I went ahead and purchased and replaced all four of the capacitors. I can report that my subs are no longer humming and sound amazing. Cost for the capacitors for me was $1.50 each. Since I purchased the speakers used and with the humming sounds, I never experienced them or their amazing bass. I disconnected my Velodyne sub and now have both the subs connected for bass. Using a Yamaha RX-V773WA. @fez34 glad that worked for you and welcome to club Polk!